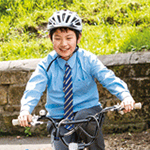 Each of the 29 local authorities that deliver Bikeability Scotland has a local coordinator to help schools like yours to get more pupils cycling. Contact your local authority coordinator to let them know that you are keen to start delivering Bikeability Scotland cycle training. You can find your local contact here. They will tell you if there are any procedures to follow before starting the training. First you'll need to decide what level of Bikeability Scotland you'll be delivering. It depends on the existing ability of the trainees. As a guide, level 1 is delivered in P5, level 2 in P6, and level 3 in P7-S2. You will need to identify people to train as instructors. They might be a teacher, teaching assistant, other member of staff at the school, a parent of one of the pupils, or a member of the local community. Your local authority may have funding to provide cover while teachers attend the course. Find out more about our training courses here. You may wish to have additional assistants at the training sessions to help with things like marshalling. Additional assistants cannot be counted as instructors for the purposes of meeting the instructor-to-trainee ratios. If you're using any volunteers or non-school staff as instructors or additional assistants, they may be required them to join the PVG scheme before they deliver training. Once your instructors are trained (and PVG checks have come through), you can set dates for the training to take place. Bikeability Scotland training usually takes place once a week over 6-8 weeks, and often in the warmer months of August to October and March to June. Your local authority contact will send you the resources needed to deliver the training, including a parents' guide which can be sent home with pupils beforehand. You can also order resources such as cones and tabards from your local co-ordinator. You'll need to notify parents of the training times and dates and give them copies of the Parents' Guide and disclaimer forms to be signed and returned before the training. Ask parents to make sure their children bring their bikes into school on those dates, and that they have checked beforehand that the bikes are working ok. Watch how to do an M Check here. You'll also need to ask parents to ensure that pupils are dressed for Scottish weather! Once the training has taken place, pupils are awarded a certificate, which includes feedback about any skills or manoeuvres that they need to practise. There is no pass or fail and pupils are awarded certificates and badges for completing the course.